There are many consumers who understand that most electric vehicles on the market today suffer from three major setbacks- driving-range, battery charging time and the price. Under the influence of global eco trends, the idea of producing electric cars has become popular seemingly fast. Manufacturers are making the Best Affordable Electric Cars so that everyone can able to buy it. manufacturers try to make a profit on this trend by producing their vision of the electric vehicles but while for some people such cars seem to be a good solution. Hyundai Kona Electric is all-electric subcompact SUV with a powerful and efficient electric drivetrain so let’s have a look at its features. The Hyundai Kona electric has a high-efficiency electric motor supplied by the innovative lithium-ion polymer battery which allows The Kona Electric to drive over 400 kilometers on a single charge. This is an impressive non-stop travel range to get you where you want to go and with confidence. You can always find out how energy is flowing or battery information with the digital instrument cluster and conveniently change gears at a touch of a button with the intuitive shift by wire system located in the center console. There are also paddles on each side of the steering wheel that let you increase and decrease the level of regenerative braking energy while you drive and this extend your range further. When it is time recharging the battery couldn’t be more convenient the charging port is hidden in the front grille for easy access. The Hyundai Kona EV is equipped with a standard fast charger when connected to a 100-kilowatt fast charging station, it can reach approximately 80% of charge in less than an hour. The Kona electrics lithium-ion polymer battery is designed to perform in cold winters. There is a standard battery temperature management system to pre-warm the battery when the Kona Electric is connected to a charger. This helps maximize performance and driving range especially when the temperatures drop. A standard heat pump system helps improve HVAC efficiency, this reduces power demands to heat the cabin and lessens the effect cold weather has on overall vehicle range. The Kona electric has the proximity keyless entry and push button to start the vehicle. The heated front seats and steering wheel are one of the many features that make the Kona electric winter-savvy, the Kona Electric has the rain sensing wipers. When the weather is warmer you’ll love the cooling sensation of the ventilated front seats. The driver seat is also adjustable eight ways making it easy to find your perfect comfort level. Kona electric has the automatic temperature control so set your temperature once and the system will maintain the cabin climate for you. The system will even automatically switch vent direction to the windshield if condensation is detected. 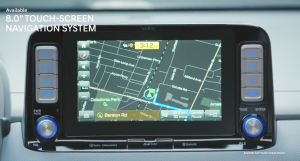 You get quick access to navigation and entertainment controls with the 8-inch touchscreen. the Infinity premium audio system fills the cabin with crisp clear sound. It has a sunroof to let the fresh air and sunshine flow in. The Kona electric is filled with technology- the head-up display helps you monitor speed, navigation and more projecting key information within your line of sight so you don’t have to take your eyes off the road. The Kona Electric has the wireless charging pad to charge the phone wirelessly. Using Apple Carplay and Android Auto you can access your favorite smartphone apps and features directly on the touchscreen display. The Bluelink mobile app keeps you in touch with the Kona Electric wherever and whenever. Using that App, you can start the car remotely, see the vehicles charge status and more. The Hyundai Kona electric has a closed front grille with active grille shutters that dynamically adjust to driving conditions for enhanced aerodynamics. The Kona electric also features aerodynamic 17-inch alloy wheels that are not only stylish but functional improving efficiency on your drive. Stylish LED lighting technologies include LED daytime running lights, LED headlights and LED taillights. To enhance the safety, turn signal indicator lights mounted on each side mirror to help convey your intention to make a turn. Kona Electric comes with two-tone roof color options to show off your individual style. 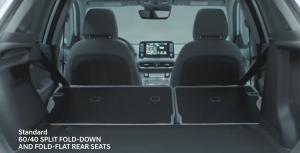 Due to the innovative packaging of the battery, you can still enjoy full cargo space in the rear including 60:40 split-fold seats that can even fold flat for maximum cargo space. For valuables that you want to keep out of sight, you can use the storage hidden under the floor. Standard multi-link rear suspension enhances overall agility and handling giving you that Road hugging feeling. The Kona electric also features drive mode select which allows you to customize the steering feel and overall powertrain responsiveness. You can choose between comfort or eco for more conservative power delivery and eco plus to further maximize your efficiency or sport mode which uses the electric power to boost torque levels for a more dynamic driving experience. The superstructure of Kona Electric is made from the high-strength steel making it lightweight yet incredibly strong. The Hyundai Kona Electric features Hyundai smart sense safety technologies. The Forward collision avoidance assist can detect a potential forward collision with a pedestrian or vehicle in your path and provide emergency braking assistance if no action is taken. With lane departure warning you will hear and see alerts if you begin to drift outside of your lane. Lane Keeping Assist will apply corrective steering to help avoid steering out of your lane. Before switching lanes, line spot collision warning lets you know if a vehicle is in your blind spot. Hyundai’s innovative system senses the speed of the vehicle in the adjacent lane, if it’s approaching faster than you can safely make the lane change it will signal an alarm. Driver attention warning analyzes your driving patterns and will suggest taking a break if it detects driver fatigue or inattention. Night driving is made a little easier with help from the high beam assist system. It will detect automatically when to switch high beams on and off. There are two ways Hyundai smart sense features also help make reversing safer parking distance. Warning sensors let you know if you get too close to an object when you’re backing in. When backing out of a tight parking space rear cross traffic collision warning will alert you to vehicles approaching from either side even before they appear in the rearview camera. Hyundai Kona Electric may be eligible for government rebates so check your local regulations. If you have any queries about this post, let us know in the comment section below.